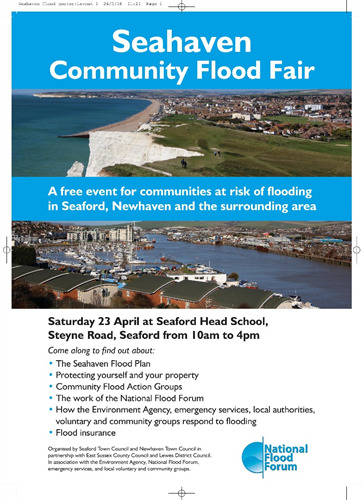 Following the highly successful community engagement evening on the Seahaven Flood Plan in January, the Seahaven Community Flood Fair is being held on Saturday 23 April between 10am and 4pm at the Seaford Head School, Steyne Road, Seaford. The Flood Fair, organised by Seaford and Newhaven Town Councils in partnership with East Sussex County Council and Lewes District Council will provide information and practical advice to residents at risk of flooding in Newhaven and Seaford and the surrounding areas, but is open to all who may be directly or indirectly affected by flooding or would like to find out how they could help if flooding occurs. Visitors will be able to learn more about the flood risk from the Environment Agency together with ways they can protect themselves and their property. Find out about the Seahaven Flood Plan from Lewes DC and how local authorities and emergency services respond to the threat of flooding and the important role that voluntary and community organisations play. A highlight of the Fair will be the presence of the National Flood Forum who will be providing advice on many flood related matters including resilience, resistance and recovery. They can also offer advice on flood insurance and the new Flood Re scheme for homeowners as well as demonstrating flood protection measures. December was one of the wettest months on record in the UK and the importance of flood defences, practical action plans, and building community resilience through such measures as the formation of local community flood action groups has never been more important. The National Flood Forum is a national charity dedicated to supporting and representing communities and individuals at risk of flooding. It helps people to prepare for flooding, helps them to recover their lives if they have been flooded, and provides advice and support on all flood risk issues. It works to ensure that flood risk issues are understood and addressed by Government, its agencies and other national organisations, to ensure that they develop a community perspective.